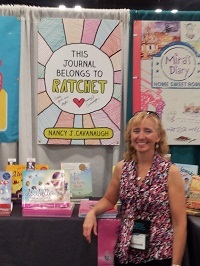 What fun, introducing our TeachingAuthors readers to (1) my former-student and long-time friend, children’s book author Nancy J. Cavanaugh – and – (2) her debut middle grade novel This Journal Belongs to Ratchet (Sourcebooks/Jabberwocky)! When I first read Nancy’s manuscripts, some 19 years ago, I knew instantly: she was the Real Thing, ripe with talent, original stories and a unique voice. Her teaching experience showed through, too, helping her target the right format for the right story for the right reader. Nancy also evinced Passion, with a capital P, and enough Perseverance to serve three children’s book writers no matter where they were in their careers. Editors and agents as well as writing kin agreed, offering the necessary encouragement, revision suggestions and interest to keep Nancy keepin’ on. Today she’s represented by Holly Root of the Waxman Leavell Literary Agency; Kirkus starred This Journal Belongs to Ratchet; and Sourcebooks just bought her second middle grade novel! 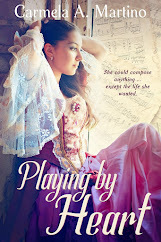 She also contributes to the group blog of the debut authors of 2013 – the Lucky 13’s. A Student Success Story indeed. As for Ratchet's "Student Success Story," she spends her days fixing cars with her dad in the garage, living in a world of spark plugs, pistons, and crankshafts –not exactly normal for an eleven-year-old girl. Even with the odds stacked against her, Ratchet endeavors to change her life and realizes her skill as a mechanic might just be the path to her first friend. But in the process, she alienates her father and discovers a secret she wishes she never knew. She finds a way to, not only accept the truth she discovers, but also accept herself and her dad. I’ve been sharing this original story in this original format with teachers and Young Authors since I received my ARC from Nancy in February. All love the book – and Ratchet - as much as I do. 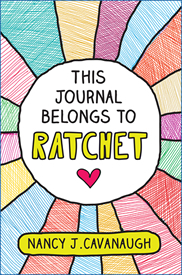 Be sure to enter our TeachingAuthors Book Giveaway for AN AUTOGRAPHED COPY OF This Journal Belongs to Ratchet. Include a shout-out for your Favorite Car – real, imagined, long-ago, present, fictional, cinematic, even longed-for. The deadline to enter is June 3. See contest details following the interview below. And, also be sure to check back in two days for Nancy J. Cavanaugh’s Wednesday Writing Workout! 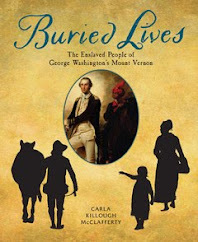 Thank you, Nancy J. Cavanaugh, Children’s Book Author (! ), for sharing your Writer's Journey, yourself and This Journal Belongs to Ratchet with our TeachingAuthors readers. We first worked together privately in the early 90’s when you were just beginning “your race to the finish line,” on two picture books that still remain in my heart and on my brain’s Hard Drive. Do you recall what you were hoping to learn – and – what you indeed took away – about writing, the Children’s Book World, publishing - so you could keep on writing? I was hoping to take my writing to the next level, so my questions were: Do I have all the essential parts of the story? And, what will make my story marketable? Two things I remember learning from you: 1. not to miss opportunities – opportunities to develop my characters, opportunities to add layers to my story, opportunities to add emotion to the overall plot; 2. to dig deep and find out what my story was REALLY about – not just on the surface, not just what was happening, but what “life thing” the story was really about. I’ve always considered your classroom teaching experiences That Extra Something that bolstered both your writing and the stories you chose to tell. 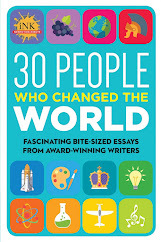 Please share how your teaching impacted, influenced and inspired your writing? As a teacher, and then later as a librarian, I got to read SO many books aloud to students, and I had the opportunity to see what young people were reading and what they liked best. That’s sort of the obvious way in which my school experience helped my writing, but something not quite so obvious is the impact of the repetition of certain stories over the years. There are many books which I read over and over throughout the years, and as I did this, I was learning the patterns of language that we find in stories. These patterns were practically becoming engrained in my DNA. The understanding of what “story” really is was becoming part of my soul. I believe that understanding of story is always at work in me now as I write. What kept you going all these years so you could indeed cross your much-desired Finish Line? How did Ratchet’s story come to be – and – why did you choose a home-schooled student’s journal as her storytelling vehicle? The idea started with a character, and her name was always Ratchet. My ideas usually start that way, and then I let my imagination dream up what the character’s issues are and what her story might be. I chose Homeschooling for Ratchet because it seemed to be the best way to isolate her. Also, because of her father, it made sense that he wouldn’t want her to go to school in mainstream society. The idea of writing through the assignments in Ratchet’s journal came to me in the very beginning, but it took a lot of figuring out along the way in order to tell the whole story in this format. What about the revision process for This Journal Belongs to Ratchet? 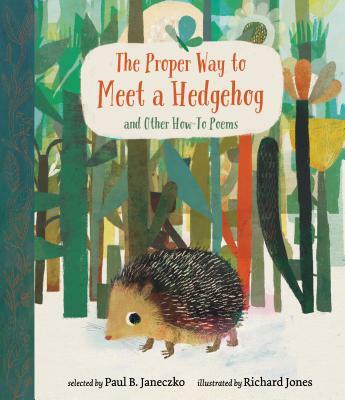 How did your agent Holly Root and your Sourcebooks editor Aubrey Poole help you fine-tune the manuscript to earn a prized Kirkus-starred review. My agent Holly is a wonderful editor and always has helpful suggestions before we send something out, but I had already done a great deal of revising before sending it to Holly, so we didn’t really have to do much – just a few tweaks here and there. When my editor Aubrey read Ratchet, though she loved the character and the story, she asked for revisions even before Sourcebooks acquired it. She gave me some specific direction as to what she was looking for and thankfully I was able to deliver. After Sourcebooks bought the manuscript, Aubrey and I did two more rounds of revisions, and I absolutely loved it because she’s a fabulous editor. She always had an amazing vision for what the book could be, and she guided me so that my writing would get there. I also have to add here that Aubrey worked hard to get just the right cover and artwork for Ratchet, and I think that has really made this book stand out and become something special – so much more than I ever imagined. My next book will be coming in Fall 2014 and will be another alternative format. 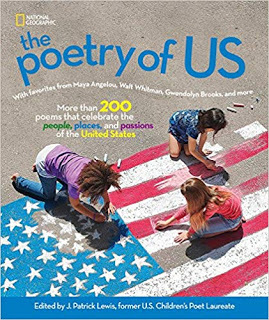 The entire story is told in lists, letters, and writing assignments, in which a girl named Abigail uses her language arts class’s Friendly Letter Project to cope with the worst school year ever – and in the process turns it into the best year ever. Our blogiversary giveaway was such a success that we're again using Rafflecopter to run this giveaway. If you've never entered a Rafflecopter giveaway, you may want to read their info on how to enter a Rafflecopter giveaway and/or the difference between signing in with Facebook vs. with an email address. As it says in the "Terms and Conditions," this giveaway is open to U.S. residents only. You must be 18 or older to enter. And please note: email addresses will only be used to contact winners. The giveaway will run from now through June 3, 2013. Winners will be notified June 4, 2013. If you have any questions about the giveaway, feel free to email us at teachingauthors [at] gmail [dot] com. Congratulations, Nancy! I'm so happy for you, and I can't wait to read RATCHET. Wow - this looks fantastic! The cover art is indeed a snazzy draw for the MG reader. Thanks for the comment, Cathy. And good luck to you and all those entering the giveaway! I've always had a fondness for Herbie! Watched one of his movies with my kids recently, and they loved it too! I've heard so much from Esther about how great this book is, and I can't wait to read it! My favorite car? A Classic, of course - the 1955 Chevy! I enjoy hearing about the journey authors take to publication. Thanks for sharing. My favorite car was my father's Karmann Ghis from the 70s. I remember how impossibly small it was. One year we had to stuff a Christmas tree in it along with my brother and me. We looked like a comedy act. I'm so glad my interview with Nancy got readers' engines going...and...is revving up their automotive memories too. Talk about fuel: we should bottle up Nancy's Perseverance and Determination just in case we might lose steam some day. I'm legally unable to enter the Book Giveaway Raffle, but My Favorite Car will always be my 1969navy blue Beetle Harold. I might be too old to drive by then! So much enthusiasm for cars - I love it! I had an old VW Bug in my favorite color blue - I loved that car - the only bad thing, it didn't have heat and I was going to school in MN at the time. :) Thanks for all the wonderful comments about RATCHET! I have no place to drive it, but if I did, I'd want a metallic purple porsche 935--the racing version. It has no fenders. It literally melts right into the street! I love my Saab - twelve years old and running smooth. Maybe "Ratchet" will ride along with me? Without a doubt, my favorite car would have to be my Jeep Cherokee, such a fun ride. I enjoyed the interview with Nancy and am looking forward to sharing her new book with my seventh grade students! I can't wait to meet Rachet- sounds like a friend I'd like to know (her dad, too). Great interview, especially about how to keep going in the time of rejections. As for a dream car, I've been waiting to get a new one for them to make a safe, non-polluting, fuel efficient car that will last for years. At this point I need to add one that will be accessible for a feeble old woman, since the changes on those lines re going to take forever, it seems. Hope I win, but I'll read it regardless! Brava! to Author Nancy C.
Can't wait to meet Ratchet & her Dad. Sounds like a new classic. Thanks for all the enthusiasm for RATCHET! Nancy and Esther, perfect together. So happy to find this interview, via Nancy's blog, via Facebook. Inspiring! Now Where Did Those Books Go? WWW: Holly Thompson's Poetry with a Plot! Happy Children's Book Week To You!